The remarkable increases in computer speed over the last few decades could be approaching an end, in part because silicon is reaching its physical limits. But this past December, in a small Washington, DC, conference room packed to overflowing with an audience drawn largely from the semiconductor industry, Georgia Tech physic­s professor Walter de Heer described his latest work on a surprising alternative to silicon that could be far faster. The material: graphene, a seemingly unimpressive substance found in ordinary pencil lead. Theoretical models had previously predicted that graphene, a form of carbon consisting of layers one atom thick, could be made into transistors more than a hundred times as fast as today’s silicon transistors. 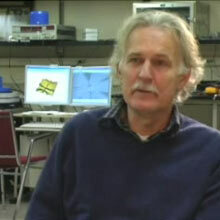 In his talk, de Heer reported making arrays of hundreds of graphene transistors on a single chip. Though the transistors still fall far short of the material’s ultimate promise, the arrays, which were fabricated in collaboration with MIT’s Lincoln Laboratory, offer strong evidence that graphene could be practical for future generations of electronics. Besides making computers faster, graphene electronics could be useful for communications and imaging technolo­gies that require ultrafast transistors. Indeed, graphene is likely to find its first use in high-frequency applications such as terahertz-wave imaging, which can be used to detect hidden weapons. And speed isn’t graphene’s only advantage. Silicon can’t be carved into pieces smaller than about 10 nanometers without losing its attractive electronic properties. But the basic physics of graphene remain the same–and in some ways its electronic properties actually improve–in pieces smaller than a single nanometer. Interest in graphene was sparked by research into carbon nanotubes as potential successors to silicon. Carbon nanotubes, which are essentially sheets of graphene rolled up into cylinders, also have excellent electronic properties that could lead to ultrahigh-­performance electronics. But nanotubes have to be carefully sorted and positioned in order to produce complex circuits, and good ways to do this haven’t been developed. ­Graphene is far easier to work with. One of the interesting traits of graphene is that it can support building transistors at approximately a one nanometer scale. To build at this scale, however, will require an advanced imaging technology if current manufacturing methods are to be used. Recent developments in plasmonics to focus electromagnetic energy at this scale may be a possible solution. Graphene is old, very old. Used as bearing material saturated in paper or leather in horse drawn carts & carriage axles.Graphene was never made for constant billions of on/off voltage variations in complex non harmonic enviorment. It is low friction due to its shape, it is electrical due to properties of that element, yet it varies widely from one molecule & situation to next. Machine run on graphene will stumble & crash, over & over with normal useage. Todays cpu uses metals that are tightly bound, graphene is lossely structure. PING of graphene is NOT precisely repeatable.Graphene will just stop or simply misfire often. You are correct, except that you are talking about graphite, not graphene. Graphite is made of many layers of graphene, which are very loosely bound to one another. The graphene layers readily come apart and slide across each other, making graphite perfect for the uses you cited. In contrast, the INTRA-layer bonds -- the bonds WITHIN graphene -- are very strong. Graphene nanoplatelets are as stiff and strong as carbon nanotubes ( 1 TeraPascal tensile strength) but they are shaped like flat plates of ultra thin graphite. These nanoplatelets have 25 micron diameter and 5-10 nanometer thickness. They can be used to improve the properties of a wide range of polymeric materials, including thermoplastic and thermoset composites, natural or synthetic rubber, thermoplastic elastomers, adhesives, paints and coatings. They blend easily with monomers and polymers. They been found to: Increase electrical conductivity, increase thermal conductivity and thermal stability. They improve barrier properties, permit reduced component weight. They increase stiffness, increase toughness (impact strength), improve appearance, including scratch resistance and they have flame retardant properties. They are under research as a result of their novel properties; The have been used to make transparent electrically conductive coatings on solar cells, nano transistors that withstand much more heat than silicon transistors, materials to store hydrogen in fuel cell vehicles, anodes in lithium ion batteries and thousands of other possible uses. - $40.00 per gram. Contact for bulk discounts.